Another rubbish week weather wise but the forecast for the next week does look promising. Being oop north things seem to be a couple of weeks behind the south and progress is slow. Work is picking up pace and it looks like I am in for a busy 12 weeks. Needs must I suppose. I am looking forward to finishing work and spending a couple of hours pottering around the garden during the lighter nights with the work phone firmly in the house. It makes you wonder what i did before I took up gardening. Ever since I have moved into this flat 17 years ago I have had this one plant with clover like leaves and small vibrant pink flowers that bloom for months. It has always been a favourite of mine but unfortunately I did not know it’s name. Thanks to the power of Facebook (boo, hiss) I have now finally got a name for it and I have just found out it is edible!. I have read it can spread like wildfire but this must be a hybrid as it just comes back in the same place year after year. I have now taking a few rhizomes and planted them in a couple of extra places and these are starting to sprout already. I am told it could be O. debilis or O. crassipes ‘Rosea’ apparently. Will post pictures of the flowers later on this spring. Just had a taste of it and it is as they say very citrusy. 2. Sycamore or Ash seedlings? Sedum Cauticola I bought this in February and after a healthy few weeks of growth it has become a bit stagnant. Hopefully the sunny weather will kick it back into life. It’s my first time growing sweet peas. I planted them into the garden riskily last October and after the interesting cold weather we have had last year I am pleased to say they are doing well. Looking forward to harvesting the flowers. Most of us do it. Those of us that have not got room for a decent greenhouse and need a bit of instant colour in their garden. We go to the garden centre and are brainwashed by the rows upon rows of healthy plug plants. The trouble is I don’t know what to make of them. Sure they add a bit of bling but you realise they don’t attract wildlife as much as more natural plants. I will probably still carry on with tint of guilt but sometimes needs must. That’s my SOS. The sun is out and i am off into the garden. You’ll have a good idea what the seedlings are if you just let the next pair of leaves come through. I used to get LOADS of sycamore seedlings, but then we had the trees removed (!) Ash is a notorious self-seeder too. It’s worth catching them quick as they are a nightmare if they get going! I have that wood sorrel too and didn’t know what it was or that you can eat it. Thanks for the info. Well done on sowing your sweet peas in October. Keep on meaning to but never get round to it. This year. I love the sound of the pink wood Sorrel. I found a lovely patch in the woods this week whilst walking the dog but I suspect it’s the common white one. Will go back soon and take a look. I knew they were edible but the leaves were small so I let them be. Fred gave us a recipe a couple of weeks ago for sorrel & I thought I’d never eaten it before. Maybe I haven’t but your wood sorrel, we used to chew it as kids & called it sour weed. Not something our parents taught us, but just what we called it. We thought we were so daring, eating weeds. My gosh, don’t your peas look great! It tastes really good. Impressed by the sharpness of it. I can not identify the tree without pictures or a better description. Send pictures of the new leaves and bark and any distinguishing features you see. I can likely tell you what genus it is, but may not know the specie of the tree for your location. For example, the few ash trees we have here are probably different from what grows there. Okay. Ash sounds more credible. You would probably recognize it if it were a sycamore. They are pretty distinctive. Not sure if you’re aware, Tony, but what’s usually referred to as a sycamore over here, is a sycamore maple, not the American sycamore w/white bark. Oh, I did not think of that. It would still be rather distinctive, with those big leaves. I think the Latin names of some of those trees are a funny commentary. Acer platanoides = ‘maple that looks like a sycamore’. Platanus X acerifolia = ‘sycamore with maple leaves’. Is the sycamore maple the Acer platanoides or the Acer psuedoplatanus? I would not know the Acer psuedoplatanus if I were to see one. We do not have them here. However, the Acer platanoides was a common street tree in San Jose, and although it is a weed in the East, I really like it here. You’ll have to ask one of the SoSers who know the Latin names. The only reason I thought to mention it is when I first moved here & folk talked about sycamores, I wondered why they were talking about trees with maple leaves, so I looked it up. I find it really strange that I am growing sweet peas at the same time as northern hemisphere gardeners! The general rule is to have them planted by St Patrick’s Day, but I was a bit late this year. Mine are only a little smaller than yours. I found two packets of sweet pea seeds in a box yesterday. Tomorrow I’m going to shove them in the ground and let them take their chance. My “properly grown” ones are starting to cling to their support wires already. 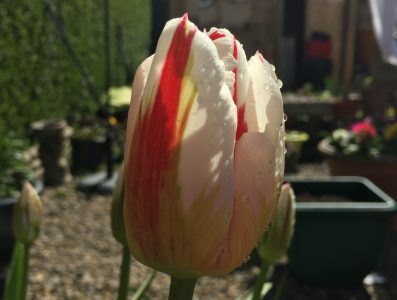 I aim to grow a range of plants that provides something for wildlife through the year but also to grow a range of plants that provides colour. There’s nowt wrong with some garish primulas and pansies (in the right place of course) to brighten the days up. I’m glad that your Oxalis is better behaved than mine. Here the annual neighbourhood battle has just begun. It’s swearing in a four-part harmony! Yes I have read about wild Oxalis and it does sound like a nightmare. I think mine is a hybrid plus it is crammed on a really thin border under an Ivy Hedge.